Chef Jose Martinez has been in the restaurant business since 2000. Originally from Tijuana, Baja California he is drawn to seafood and loves to create menus that modernize the classical by allowing himself to evolve and adapt through fusion cuisine. Chef Jose has been in Residential campus dining for over 6 years, prior to that he has been in fine dining and private catering through Washington and California. Jose believes in menu engineering by the utilization of fresh local sustainable produce, market trends and customer demand. 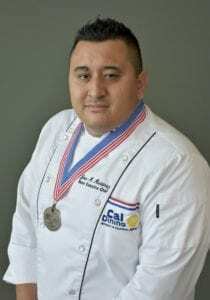 His vision is to enhance the Cal Dining experience, create a local culinary trend by utilization of fresh ingredients with a fusion approach to please the college crowd. Menu engineering will promote a trip around the world in the resident halls and emphasize the complementation of dishes to create a unique dining experience. Plans to create a progression in the Residential culinary program with training and development of the staff, menu/recipe engineering and overall active listening to approach and solve opportunities. Chef Jose is excited to join the Cal Dining team, start a new page in his career and start marinating the culinary experience in people’s lives. Favorite food: Shrimp and Scallop Baja style burrito with chipotle aioli, cilantro/lime rice, fresh pinto beans and jicama slaw. Fun Fact: Catered private events with Naked Sushi. Current flavor trends that influence my menu are customizable ethnic dishes that flare up the season by utilizing spices that can hit authenticity, enhancing flavor with different cooking techniques. Smoking and charring of different chilies to hit a flavor profile and enhance marinates on protein and vegetables. I get ideas from dining culinary experiences, colleagues, internet, is amazing what other chefs in different parts of the world are defining in this field. Farmer markets are a huge source of inspiration, it’s always fun and exciting to try something new with local/seasonal ingredients, re-invent the wheel with my personal twist. Past culinary experiences mixed with current trends and crafted with personal palate. It’s always responsible to do balanced meals that nourish the body and palate, ancient grains, intact whole vegetables, low sodium/sugar. The trick is to enhance a dish with flavor adding cooking techniques and natural healthy spices that if you work them right, they won’t miss the sugar or extra salt. Smoking, preserving, marinating, high smoking point added to spices and aromatic ingredients take a dish to a different level by adding layers of flavor profiles that take you to umami heaven. I see Vegan chaat as a growing trend in the future, the utilization of ethnic ingredients to enhance vegan based dishes in a customizable dining experience. Indian food is a cuisine that takes vegetables to a different level by just extracting the most basic flavor elements of the most basic ingredients such as chilies, peppercorns, garlic, onion, tomato. Chaat masala is a combination of spices that work together to create a symphony of taste explosions in even the most simple dish. I focus on sustainability by choosing transparent vendors that provide local product that have a great impact in the community, clean practices free on antibiotics, GMO’s, pesticides, hormones, etc. I’m lucky to live in Berkeley and have access to a lot of hyper local product, fair trade and Organic options. I build menus base on what’s available locally and focus on maintaining waste to minimal by making food taste good, food can be hyper local but if is not good it will not travel far to the compost bin. Describe briefly about your recipe selection: your favorite part, why would you select it? I love seafood, being raised in Baja (Tijuana) and Seattle, WA I have been exposed to great seafood creations. My favorite part is to be able to get seasonal/local/sustainable seafood in California so I need to highlight that seafood goodness in my menu and be like a toddler in a toy store. The reason why I selected those dishes is because most of the items are available locally and are sustainable, not to mention delicious! The opportunity and honor to be able to nourish people’s lives with my food, to be the foundation for someone getting the nutrition they need, to have guests indulging on culinary creations provide by my team. There are great cooks in my family, some professional chefs and some just really good cooks. Of the professional chefs my Uncle Jaime Martinez was my inspiration growing into the restaurant business at the age of 15. I had the pleasure of working alongside him (he got the jobs) in two restaurants. From him i learned the importance of being responsible, clean and attentive to the detail in cooking. “Always be moving and getting something accomplished in the kitchen, try your best and be your best, every day/all day” he would and still does say to the new cooks he trains. He is a very motivated and hyper chef, even when he is sick. Blood clams au gratin, fresh, local clams grilled on a outdoor wood fire grill at Ensenada La Bufadora (the blowhole), at that sea level and with the fresh sea breezing at you, they are just to die for. 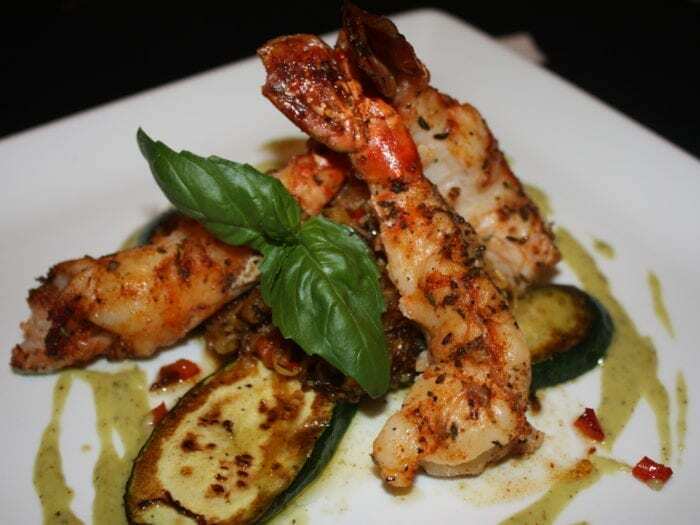 Prawns with Spaghetti SquashThe opportunity and honor to be able to nourish people’s lives with my food, to be the foundation for someone getting the nutrition they need, to have guests indulging on culinary creations provide by my team.